Secret Confessions of a Closet Knitter: Cause for celebration ..... or not? Cause for celebration ..... or not? I was lucky enough to pick up four Socks That Rock Rare Gems skeins at the start of the year (see here), and they had been languishing in my stash ever since. So in order to celebrate getting a temporary job (hey, when you're unemployed, even a days work is good news), I decided to celebrate by casting on a special pair of socks. 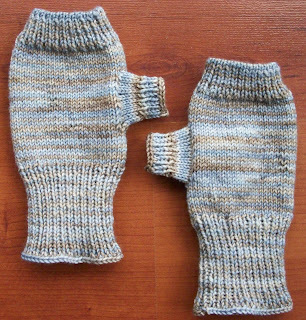 The job fizzled out, but the socks turned out much better than I had hoped. The colourway of this particular Rare Gem didn't initially appeal to me, but I'm really happy with how these turned out. Apart from some pooling on sock number one, the textured pattern really brings out the best of these colours. 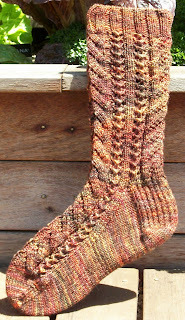 I'll definitely be using this pattern again for some of my other Socks That Rock skeins. 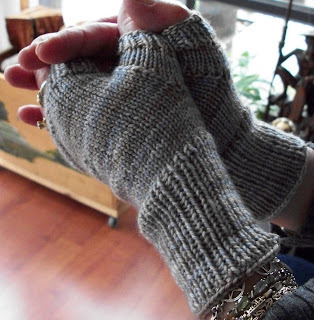 In other news, I had to redo the Smooshy Winter Gloves I made for my mother. It turns out that Sanguine Gryphon Bugga stretches a lot, and the pair I made for my mother's smallish hands now fit my father's giant sized ones! Modifications: Cast on 50 stitches instead of the 60 the pattern calls for. This way when they stretch, they'll actually end up being the perfect size.